On Being Gay, And Socialist, In Cuba Today : Parallels Isbel Diaz Torres sees his LGBT rights activism as an extension of Cuba's socialist revolution. Attitudes are changing, but he's still struggling to find a place in the island's political landscape. Isbel Diaz Torres is an LGBT activist in Cuba. He sees his fight for equality as an extension of Cuba's socialist revolution. It was very late at night the last time Isbel Diaz Torres and his boyfriend were stopped by Cuban police. "They asked for our IDs, which is a rare procedure," Diaz recalls. The policeman then dropped the men's IDs on the floor.
" 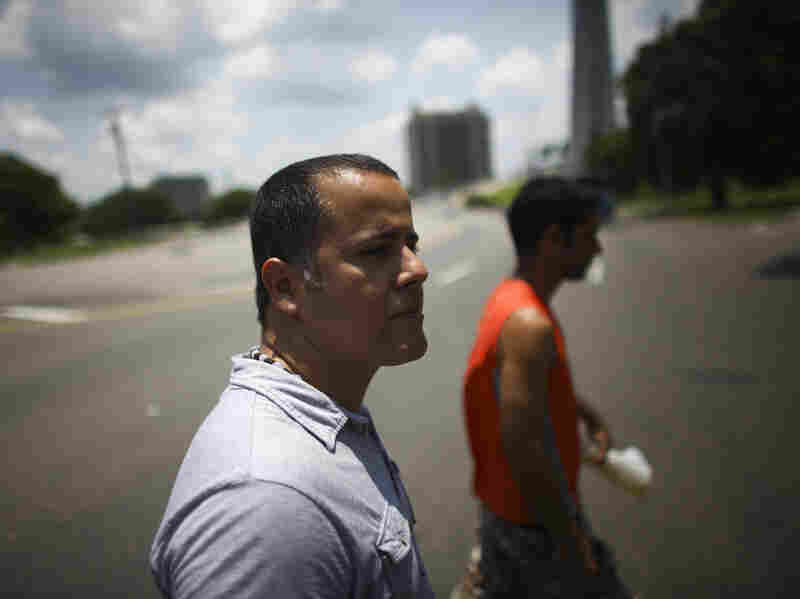 'That's very funny for you, a very funny thing to do,' " Diaz, an LGBT activist, said to the policeman. " 'Because you want to humiliate me, that's right?' "
He took the policeman's information down and went to the station to report him. "It wouldn't change anything, but it is my civic duty," the 38-year-old Diaz says. There is a long history of homophobia on the island. "Sons of the bourgeois, they go around with their little pants that are too tight. ... They want to do their girlie scenes out in the open," is how former Cuban President Fidel Castro attacked the young opposition in a 1963 speech at the steps of the University of Havana. During that time, gay people, along with other "counter-revolutionaries," were sent to forced labor camps. Cuba's attitudes toward sexual orientation have changed a lot since then: There's been a recognition of LGBT rights, promoted in no small part by Castro's own niece, Mariela Castro. Fidel Castro himself has recently criticized the machismo culture of Cuba and urged for the acceptance of homosexuality. Activists like Diaz acknowledge the importance of these changes, but say it's hardly enough. Diaz says it's happening mainly in Havana, the capital, where there are gay-friendly bars, for instance. But Diaz says he wants to be more than just able to have a good time out in the open. "We can socialize. We can be together and have fun together," he says. "But you cannot build political groups in those bars. You wouldn't be allowed." Ultimately, Diaz wants concrete laws protecting the Cuban LGBT community. "We recently have changes in the Communist Party where they included a clause claiming respect for people with different sexual orientation," he says. "But that is not enough, because most of the people here in Cuba are not part of the Communist Party. We need real laws." For example, if his boyfriend is in the hospital, Diaz wouldn't be able to visit him. "Entrance to the hospital is limited to the familia, the close relatives," he says. "I wouldn't be allowed in ... even if we lived together for 13 years." Attitudes toward the Cuban regime have traditionally been very polarized — split neatly between a right-leaning opposition and leftist supporters. But a new generation is changing that. Diaz represents a class of young socialists that is also highly critical of the government. Diaz is a member of the group Observatorio Critico, or Critical Observatory, a network of collectives seeking a place in the Cuban political landscape. They have a blog, which they publish via email since Internet access is limited in Cuba. The activists aren't really able to see the final product, or the comments, but still like to have an online voice. Staking a claim in cyberspace is difficult for these groups. Finding an actual physical meeting place is an even bigger challenge. Often, they meet in the park. In fact, that's where we meet with Diaz; he says he doesn't feel safe bringing us to his house. But meeting in public to discuss discontent has its drawbacks — namely, unwelcome guests from the government listening in. The Cuba Diaz envisions is one where everyone can be involved in the decision-making. "We also are fighting for a country where all the differences can be shared," he says. "Racial differences or cultural differences or sexual differences can be, can live together, can find a space for themselves here." It sounds utopian, but Diaz is OK with aiming high. "Maybe centuries ago it was funny to talk about the eradication of slavery, and it happened," Diaz says. "I think utopia, that's what moves a lot of people and thinkers and people of action during the history of humankind. We don't have to be afraid of that." You can follow Jasmine Garsd on Twitter @jasgarsd.